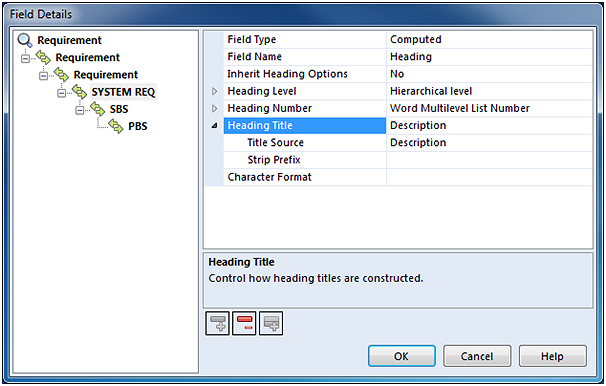 Document Publisher provides a new mechanism for creating section headings in your output document – the heading tag. This tag generates headings and automatically applies an appropriate style to create a hierarchy of sections and subsections in the output document. 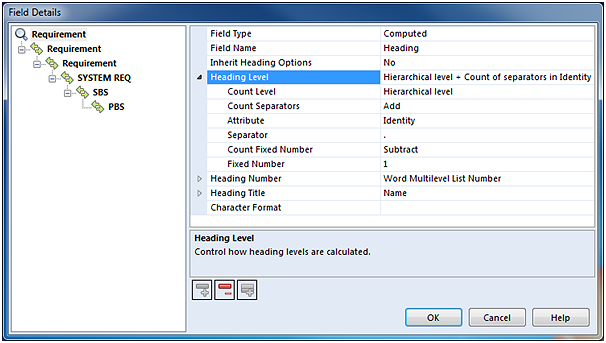 Full control is provided at each row of your hierarchy to give unbridled flexibility in heading definition. This tag is intended to replace the existing DocumentSectionNumber and DocumentSectionTitle computed field tags. 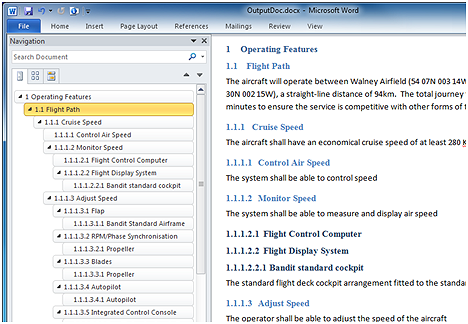 The following describes the various controls for the heading tag. For each level in your hierarchy, specify how to calculate the outline level (and thus, heading style) to build up the structure of your document. You can base heading outline levels on hierarchical level (the default), or a count of the number of separators (dots, dashes or slashes) in an attribute, or a fixed number. Any summation of these attributes may be used. The heading tag's default configuration assumes that Microsoft Word will be in control of the numbering. 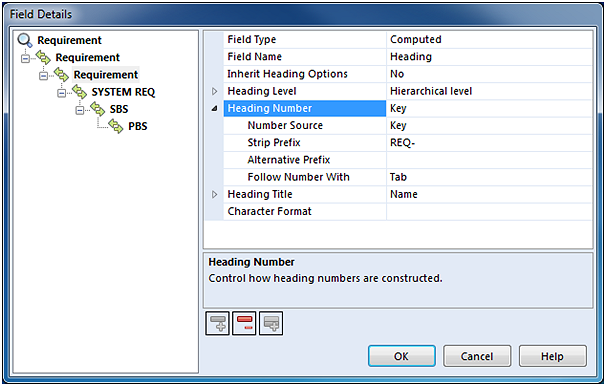 However, manual heading numbers may be produced from items' attributes such as Identity, Key, Group or category code, with optional prefix removed. The heading tag allows you to specify the attribute for the title. This can be any of Identity, Key, Group, Description, Comment, category code, static text or no title. By default the heading tag will apply Microsoft Word's built-in heading styles, i.e. Heading 1…Heading 9, or whatever heading style has been applied to the field tag. 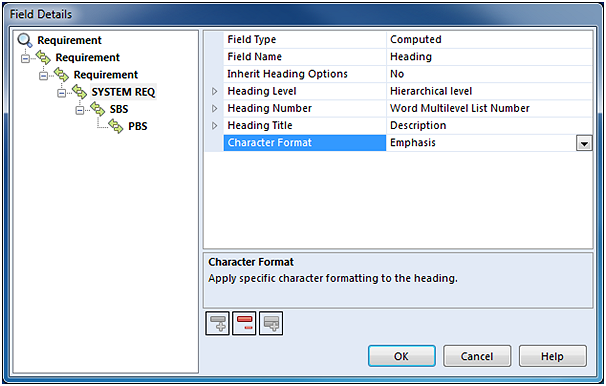 To complement this you can override the formatting at a chosen level by selecting a named character format from your template. 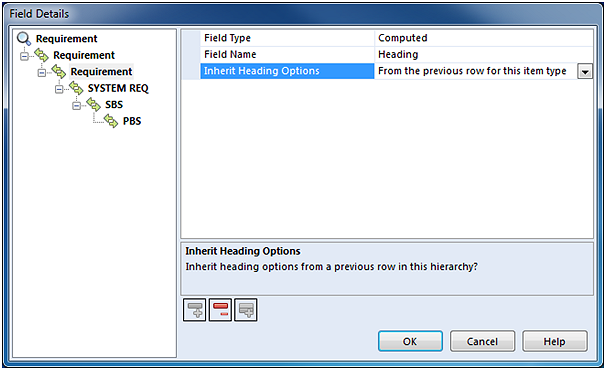 The heading tag supports inheritance of options across the hierarchy allowing you to reuse options. For instance, where the same item type is repeated at various levels, heading options need only to be defined once at the top of the hierarchy, lower levels can then inherit options from a previous row of the same item type.